and it seems like most people really enjoyed it. type of thing covering other games in the future. through over the last few years. Let's kick things off by talking about the basics. in handy all over the place. the target low enough that you skip this whenever possible. fight with Dixie in front. do is called goal swapping. while also exiting the level. This is used a few times to set up certain kongs being in front for future stages. are invested and want to become more advanced, I'll link some resources at the end for you. Let's dive in to the first world of Gangplank Galleon. them - here's the first one in Pirate Panic. jump by Diddy to reach. stage, use a team up toss to reach it. from the ground to reach the barrel right here. And finally Topsail Trouble's warp is right underneath you at the start. are fake and won't land on the platform, wasting time, but it's still pretty minimal. to do the same thing again. After the 2nd egg is where the RNG comes in. Quickly team up toss to the nest and jump to the left to avoid damage. it, then repeat the process one more time to take him down. Crocodile Cauldron is much the same, but I do a bit more goal swapping here. getting a DK barrel wastes some time here. the target which will trigger her shorter fanfare animation. The warp is right after the first Klampon. of faith off this hot air balloon to reach the next warp barrel. Swapping to Diddy is a tiny bit faster than jumping on the target normally. Shaft, and make sure to switch back to Dixie one last time for the boss. time once a cannonball spawns in to hit him. cuz this level has Rambi. if you're worried about dying, take it easy when you're just starting out. toss Dixie into the 2nd barrel and continue on. right before the final barrel that normally takes a lot longer to complete. Huge bonus swag if you collect the G letter! it'll slow your momentum completely. trying to stack combos of bouncing on kremlings heads. it's the easiest of what are called wrong warps. level completed as a failsafe written into the coding. To start off we're gonna do a neat little trick that's unrelated to the wrong warp. out of the water before the piranha bites you. Now here's where things get a little tricky. Face to the right as you land on the mast to spawn in the first beetle. Follow it to the left and jump on the 2nd beetle near the edge of the screen. Pick it up, then throw and repress Y quickly as the other beetle runs into you. object in her hair, there's a pretty forgiving frame window to pull this off. From here just continue the main path and fall off the ledge to the right of the continue barrel. right as it goes off the top of the screen, throw to the left. It might take some practice but it's a big time save and one of the easiest "harder"
tricks in the game, if that makes sense. where to shoot yourself, but the biggest skip is near the end of the stage. recommend it until you're confident because you need both kongs for the next part. After the Klampon, roll off the ledge with Diddy, and clear the next platform of beetles. Then team up toss and throw Dixie high to the right off the left side of the ledge. end from here and finish the level in style. and hitting him as soon as he lands 6 times to move on to world 4.
might be nice so you can skip over the sticky batches of honey with hair gliding. Be sure to go up and grab Squitter along the way because you'll need him for a really fancy skip. over the Krook and throw Dixie as you move you can speed right by this whole section. and congratulate yourself on doing the "scrolly scroll" glitch...yeah that's the official name. Target Terror is an auto-scroller which means it's a great time to read some donations. Pro-tip, you can rest on the brambles below you without taking damage. makes it much harder to react to the obstacles in your way. Same thing, practice is a good call for this one. at, making the following section of mini-Necky's much easier. then jumping right as the kong returns to you to reach the hook up to the left. on another Klampon after tossing a kong up toward a different hook here. It's about as free as it gets, have fun with it. in the stinger, it's pretty straightforward. Press toward the bottom right after defeating him to trigger the fanfare as fast as possible. all about cycles and execution. it shows off exactly how great of a speedgame DKC2 is. times so that you won't have to wait for them to reappear. levels with speed in mind, I just love it. despawn him and continue to the exit. DON'T jump to cross this gap otherwise you'll enter a bonus room and waste a ton of time. again to enter the 2nd bonus room to waste even more time. Yeah I'm still bitter about this one. Dixie in this stage for that extra cushion of maneuverability. glide all the way to the target. more menacing than it actually is. to just fall down the pathways avoiding bees and obstacles. For example, the ending is probably the most important part, and definitely looks the coolest. after you pass the 2nd row of bees to finish the stage without getting stung to death. moving upward instead of down. can be frightening as a wrong move means instant death. the stage comes down to...you guessed it, practice. The Kreepy Krow fight was one I hated as a kid, but it's not too terrible to speedrun. for the rope climbing sections, otherwise these flying eggs could be a bit of a problem. Switch back to Dixie for the final phase and you are on your way to the last full world! The key here is to charge at the right times to clear large sections as fast as you can. Use that shish kebob nose to your advantage! jump up high and skip a large batch of the stage. I always got hit when I was starting out. then start + select out to the map screen. alive by either placing it down and not holding Y or holding onto it and not jumping on enemies. to you - no really! Now stay to the left to make sure you don't get stuck underneath, and exit the stage. I was able to keep my momentum, and finish strong. go too early otherwise you'll have to just do it again. and prepare yourself for the final gauntlet. Your last roadblock before K. Rool is Screech's Sprint, which certainly can be nerve-wracking. to roll through them with Diddy using your invincibility frames. the rest of the race. Instead I put all that focus on staying alive. can't really skip but there are a couple things that can make it easier for you. with him, Dixie is your fallback in case you do get hit and she can dodge them with ease. Basically it helps to have her in reserves instead of potentially losing her first. attack and he will never catch you. instead of the left, then grab the last cannonball to finish a Donkey Kong Country 2 speedrun. Enjoy those well earned credits my friend. it just takes the effort to get there. an incredibly fun and rewarding run to play through. 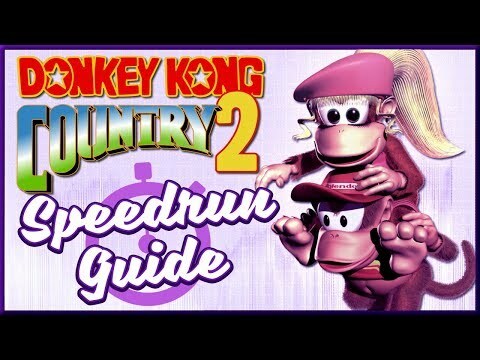 you can look into if you're interested at dkcspeedruns.com. speedran a game before, and I hope that you give it a try yourself. even catch me running DKC2 in the near future. I'll see you guys next time, stay frosty my friends!